If you're anything like me then you don't always get to spend the holiday's with all of your friends and family. I spent most of my childhood on the east coast and a lot of my family and friends still live there. Even though my brothers and sisters are out here with me in California, we still miss the rest of our family and friends around the holidays. But that doesn't stop us from spreading the holiday cheer to everyone that we love each holiday season! I love picking out specific gifts for everyone on my list but a lot of the time I just prefer to send my friends and family money so that they can buy whatever they want or put it towards bills and savings (#adulting)! Holiday gifts are great, but the reality is, many of them are just going to be regifted or hidden in the back of a closet. Yet even though we’re all thinking it, it can be a little awkward asking for money as a gift so you can buy that bag you really want. The good news: You are not alone! PayPal’s 2017 Holiday Money Habits study found that money is the most-wanted gift for the second year in a row, and 52% of Americans wish they could ask for cash instead of traditional holiday presents this year. With PayPal P2P, you can securely send and receive money with family and friends using just a phone number or email address between PayPal accounts. Be it food for Friendsgiving, the taxi to a holiday party, or that group gift for Mom and Dad, there are many reasons to use PayPal P2P payments this holiday season. 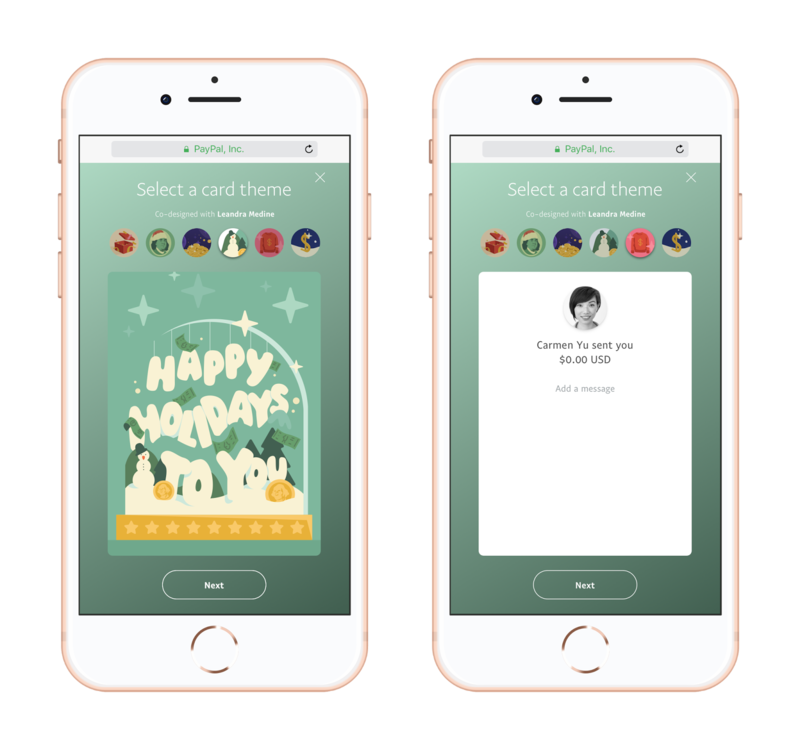 So, if you’re in need of a last-minute gift or simply just don’t know what to get all of the people on your list, seize the season with PayPal’s free P2P holiday greetings so people can get what they really want this year: MONEY. As a note, PayPal P2P is available on the PayPal mobile app, mobile web browser and desktop computer browser but the PayPal P2P holiday greetings are only available on mobile web browsers and desktop computer browsers. I have outlined how to send money and a PayPal P2P holiday greeting on a mobile web browser below! At the top of your screen, select "Pay or send money". At the bottom of your screen, select "Send money to friends and family". Enter your family or friend's email or mobile number. Type in the amount of money you would like to send to them and then click on the present box on the right side of the "add a note" section in the middle of the screen. Now this will be your hardest decision! How will you choose which of these adorable holiday greetings to send to your loved ones?! I love the variety of the PayPal P2P's new digital holiday greetings and that they were co-created in partnership with Leandra Medine, founder of Man Repeller! I sent this one to my friends. It's definitely my favorite one! I love how simple and easy PayPal P2P has made it to send the gift of money to my friends and family in Georgia and Florida this holiday season. It is so convenient because I am always using PayPal and I love the personal touches that you can add with your message as shown below. Here's how mine looked before I sent it to my family in Florida! To learn more about PayPal’s holiday offerings, go to: http://clvr.li/2hwucFV! Thanks so much for stopping by & happy holiday's!